Big Mozz has come a long way. 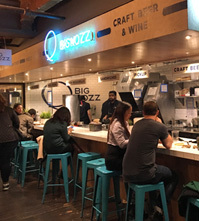 From operating a small stand selling mozzarella sticks at Smorgasburg to now showcasing a full menu at Chelsea Market. A tiled counter seats about a dozen diners. One of the highlights is the Mozzz Bomb, a ball of mozzarella injected with basil pesto and served on a slice of crisp sourdough toast with a side salad (prosciutto optional). Other options include the Chicken Parm smothered in melted mozzarella; the Great Jones Sandwich with Carolina pulled pork, mozzarella, fennel, arugula and hot pepper relish; and the Brooklyn Cubano with pulled pork, mozzarella, prosciutto and homemade pickles. House-made mozzarella sticks are also available along with fresh mozzarella to go.